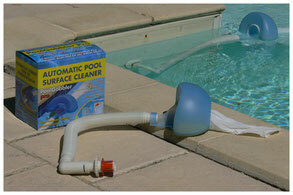 PoolGobbler Pro - the incredible automatic pool surface cleaner - Site de 1517492982 ! What does the PoolGobbler do? PoolGobbler removes all floating debris such as insects, leaves and dirt from the surface of your pool, fully automatically and without any intervention.. In less than an hour, the surface of your pool is clean. It keeps it clean as long as the filter pump is running. By its clever design it creates a circular flow on the surface. which attracts all floating debris in its filter bag. He does not obstructive. It is positioned against the walls and you can swim at all times. It requires no maintenance, just empty the filter. The installation of this patented device is easy and done at one time. He remains on the spot during all the season. It comes with clear instructions. PoolGobbler Pro is connected to one of the inlets through which the water returns into the pool. 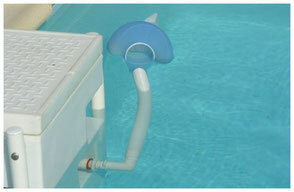 The instreaming water makes the PoolGobbler to position itself neatly against the wall. The force of the incoming water creates a vortex which allows PoolGobbler Pro to aspire the water. The result is a circular flow on the surface of the pool, which collects all floating debris in its filter bag. All insects, leaves and dirt on the surface will be captured by the PoolGobbler Pro and they will be kept in its filter bag. Your pool is clean, and it stays clean! All the time that the PoolGobbler is working. 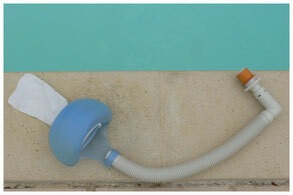 Now you can fully enjoy your pool while PoolGobbler keeps it clean !